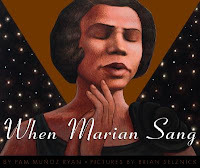 Marian Anderson was an African-American singer. Born in Philadelphia, her family and church members recognized Marian's talent at a young age and raised money to pay for singing lessons and to send her to school. Although she faced obstacles in the segregated United States, Anderson earned acclaim abroad and eventually was able to achieve her dreams in the States. The recording is great, complete with bits of songs sung by the narrator. They are a really nice touch, giving examples of what Marian might have sounded like. I could see this recording being really useful in a classroom setting. However, you won't want to miss Selznick's excellent illustrations, so make sure you peruse the book as well as listening to the recording. For more information about Marian Anderson, make sure you check out Russell Freedman's great biography The Voice That Challenged a Nation (also available on audio). 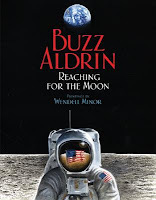 Buzz Aldrin reads his own story in Reaching for the Moon. He tells about his determination to become an astronaut and all the hard work that got him to the moon. Even as a boy, Aldrin was tenacious and his clear message with this book is "never give up!" Although the narration isn't as dramatic as a professional's would be, it's still really neat to hear Aldrin's own voice telling his story. We get plenty of requests for autobiographies and this one fits the bill nicely. It's interesting and inspiring with beautiful painted illustrations. That's funny...We must have been on a similar wavelength. I just read The Man Who Went to the Far Side of the Moon Last Night, and I was very impressed. Such a cool book.